Chef Salvador Baltazar prepares soup in the Bistro Maxine kitchen. Salvador Baltazar beams and slips a spatula beneath a crisping crepe. In one fluid motion, he flips it onto a blue plate and the scent of butter and sauteed tomatoes wafts through the snug kitchen of Bistro Maxine at 548 Ramona St. in downtown Palo Alto. French music plays in the background. Rain patters outside as car tires splash through puddles. Inside the small storefront, Baltazar lights up the restaurant with his effervescent smile. Growing up in Mexico, Baltazar cooked for his younger brothers, but never thought he would become a chef. When he came to the U.S., he planned to work in construction but a series of fortunate events landed him behind the stove. He worked his way up to becoming a chef at Armadillo Willy’s and then landed a job as a chef at Bistro Maxine. Here, he has mastered the art of the crepe. To keep the food authentic, the restaurant’s owners send Baltazar to specialized cooking workshops where he improves his skills. Bistro Maxine was conceived by college friends Judy Chapman, Stephanie Wansek and George Wansek, the latter two a divorced couple with a mission to bring to Palo Alto authentic homestyle French cuisine. The Wanseks met at a crepe-making party in France. 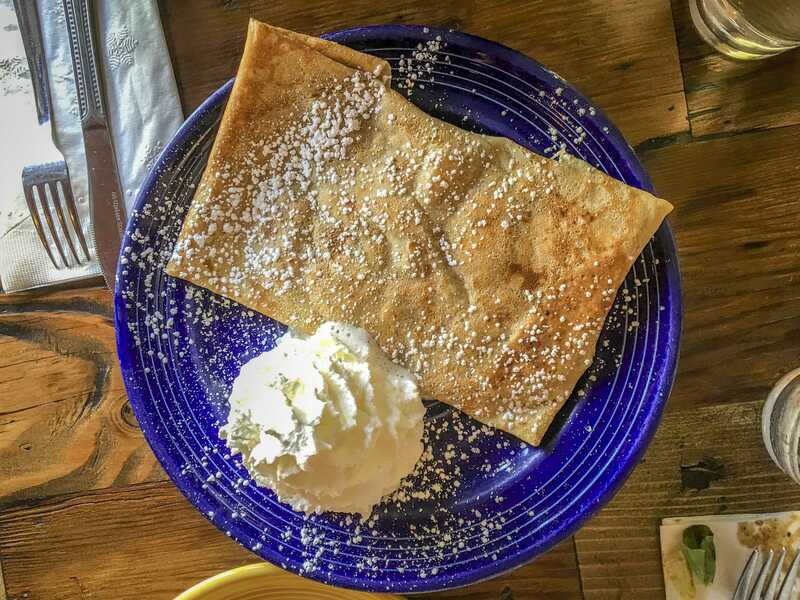 Their unforgettable experiences in France, and George’s childhood memories gave the bistro its focus on traditional crepes. Chapman’s daughter, Maxine, was the inspiration for the restaurant’s name. Today, Bistro Maxine carries the same menu as when it first opened its doors 10 years ago. However, change is in the air. In September, the bistro expanded into the adjacent storefront and gained a spacious dining room. Despite the expansion, Bistro Maxine maintains its homey feel with dark wooden furniture, brick walls, mosaiced flooring and photos of Paris hanging on the walls. The additional space has allowed the restaurant to expand its wine menu and venture into the world of children’s birthday parties. The bistro now offers crepe-making parties at which children can make crepes, while parents sip wine or coffee. 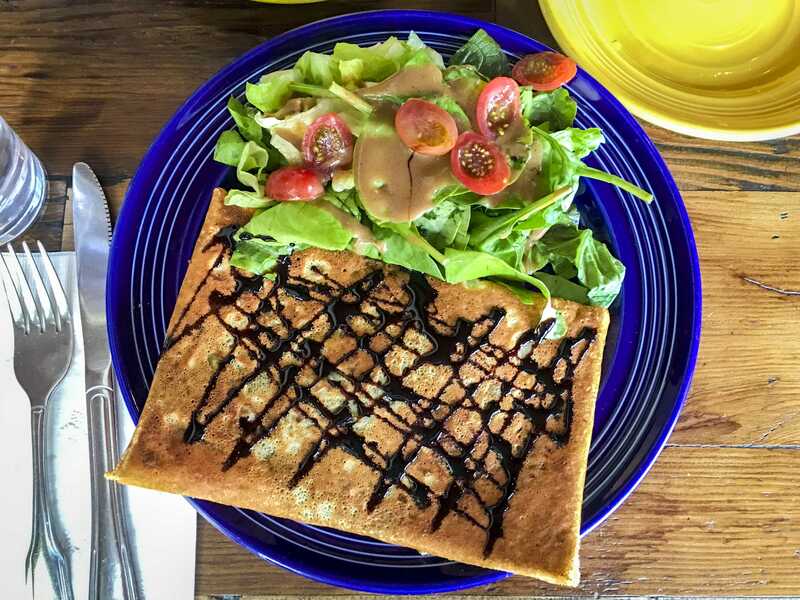 Wansek notes how much the customers love specials, hinting that the trio may add a rotating “crepe of the day” or “crepe of the month” in the near future. For now, Bistro Maxine’s simple but delicious menu paired with the cozy ambiance leaves customers feeling more than satisfied. With outdoor seating options, one small room and the recently added extension, the restaurant is well-suited for anything from a quick meal to a large party– and especially for rainy day brunches. Savory yet light, the crepe came paired with a salad dressed in mustard vinaigrette. The thin, fluffy crepe delicately tied together the tomato, spinach and mushroom flavors. Although occasionally over-crisped and leathery, the fresh, quality ingredients more than made up for the crepe’s lack of consistancy. The balsamic reduction drew out the flavor of the tomato and tied together the spinach and mushroom, providing a tangy contrast to the earthy and salty interior. The salad balanced out the plate with a simple, and light springy taste, making the Tomate Crepe an ideal main course. 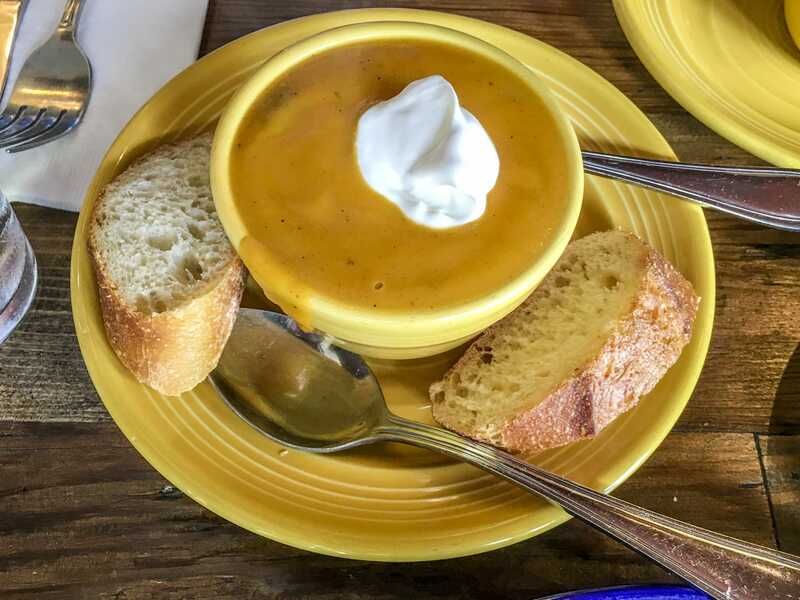 With a dollop of fresh cream adorning its sunset orange surface, the butternut squash soup was creamy, delicate, fluffy and fulfilling. The soup left us content but eager for more. A perfect balance between salty and sweet, the simplicity highlighted the nutty, hearty taste of the butternut squash. This soup warmed our mouths and our hearts. It was the perfect comfort for a wet and chilly afternoon. Sprinkled with powdered sugar, the Pomme Canelle crepe bursted with cinnamon and apple flavor. The apples were sliced right in front of us and, like all the other ingredients, was incredibly fresh. The crepe was thin and chewy, contrasting perfectly with the crisp apples. The delicate hand whipped cream countered the elasticity. The whipped cream was airy with hints of Madagascar vanilla. All together, the Pomme Canelle was a light, satisfying finish to a Sunday brunch.